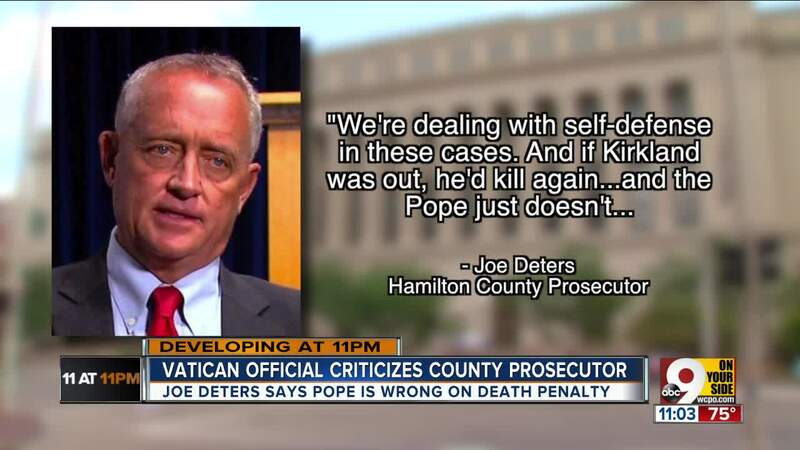 CINCINNATI -- Joe Deters needs to go to confession, one official at the Vatican Observatory believes. 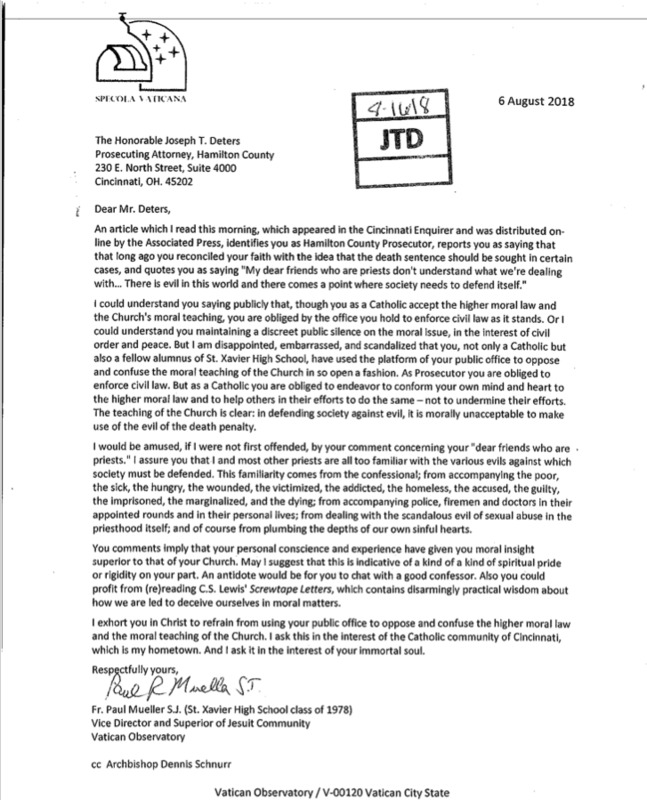 Father Paul Mueller, a St. Xavier High School graduate who is now the vice director and superior of Jesuit community at the Vatican Observatory, wrote a letter to Deters this month after seeing reports in the news that Deters believes the Pope is wrong about the death penalty. "I am disappointed, embarrassed, and scandalized that you, not only a Catholic but also a fellow alumnus of St. Xavier High School, have used the platform of your public office to oppose and confuse the moral teaching of the Church in so open a fashion," Mueller wrote. "As Prosecutor you are obliged to enforce civil law. But as a Catholic you are obliged to endeavor to conform your own mind and heart to the higher moral law and help others in their efforts to do the same — not to undermine their efforts. The teaching of the Church is clear: in defending society against evil, it is morally unacceptable to make use of the evil of the death penalty." Deters recently made the pro-death penalty comments regarding the sentencing of serial killer Anthony Kirkland for the murders of two young girls. "My friends who are priests, they don't know what we're dealing with," Deters said on "This Week in Cincinnati." "We're dealing with vicious, evil killers, okay? And it is self-defense, in my mind, for the death penalty. That's why we seek it on these types of people, like Kirkland, and we need to get rid of them." Mueller wrote that priests are "all too familiar with the various evils against which society must be defended." "This familiarity comes from the confessional; from accompanying the poor, the sick, the hungry, the wounded, the victimized, the addicted, the homeless, the accused, the guilty, the imprisoned, the marginalized, and the dying; from accompanying police, firemen and doctors in their appointed rounds and in their personal lives; from dealing with the scandalous evil of sexual abuse in the priesthood itself; and of course from plumbing the depths of our own sinful hearts," Mueller wrote. Pope Francis declared capital punishment "an attack on the inviolability and dignity of the person" on Aug. 2, right in the midst of Kirkland's resentencing hearings (the Ohio Supreme Court threw out Kirkland's original sentence because of comments Deters made). 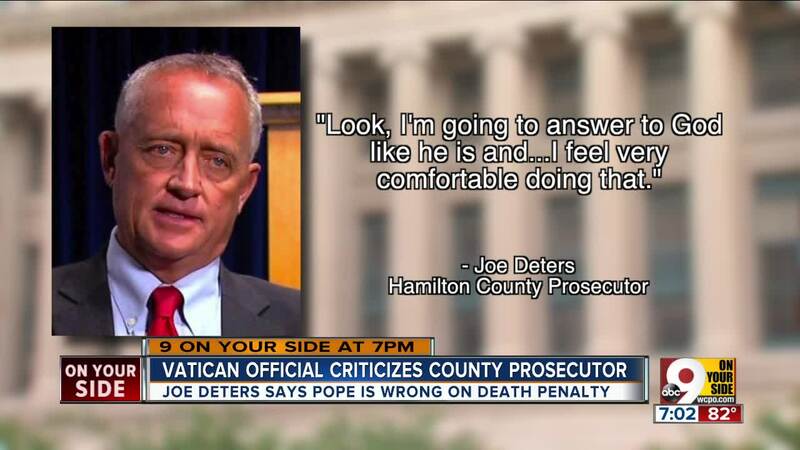 "Right in the middle of our trial -- I'm a Catholic -- the Pope said, ‘Hey, we disagree with the death penalty,' which I find confounding," Deters said on "This Week in Cincinnati." "Does that mean, like, if Hitler was on Earth today, killing 6 million Jews, that we wouldn't go after him? Are we kidding me? This is self-defense. … I'm saying the Pope's wrong; I'm sorry." Despite the Pope's declaration, the jury did recommend death again for Kirkland. Mueller wrote that Deters believes his "personal conscience and experience have given [him] moral insight superior to that of your Church." "May I suggest that this is indicative of a kind of spiritual pride or rigidity on your part," he wrote. "An antidote would be for you to chat with a good confessor." In a phone interview, Deters said he wasn't particularly concerned by Mueller's rebuke. "I got bigger problems than some Jesuit priest writing me letters from the Vatican," he said. So, he intimated, does the church. Deters said he would prefer to see the Vatican's efforts spent on addressing the allegations of widespread sexual abuse among parishes in Pennsylvania, where members of a grand jury wrote they had found one of the largest-scale incidents of known abuse within the modern Catholic Church. More than 1,000 children were victims. "He is just naive; he doesn't understand what we are doing," Deters said of Mueller. "God bless him."